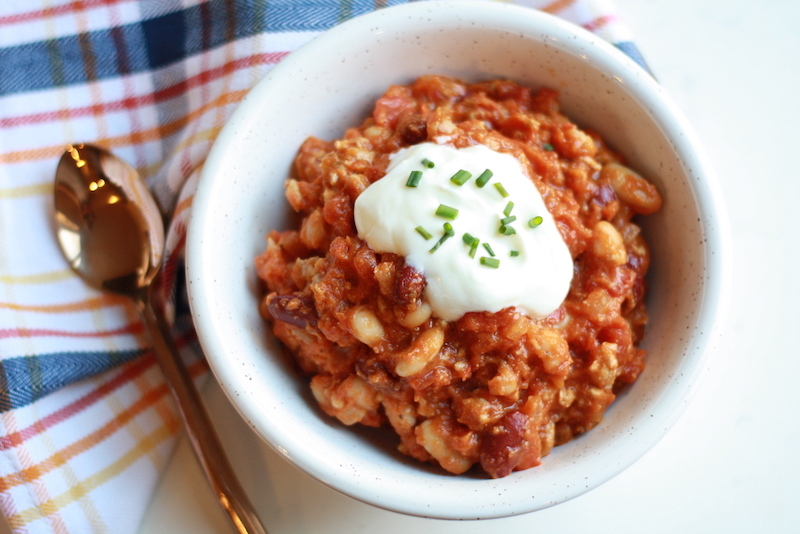 As soon as the temperature starts to drop, chili becomes the go-to recipe in our homes and has even become a Halloween tradition (pre-trick or treating). We like adding pumpkin to this recipe because it adds heartiness and a boost of extra fiber, vitamin A, potassium and iron. If you’re usually not a pumpkin fan - don’t worry, you can’t really taste it amongst all the other flavors. We love this recipe because its got all the elements for a great meal in one bowl - its full of plant powered nutrients, lean protein and lots of flavor! Plus, its great with a side of homemade corn bread. We even like to use it to fill baked potato boats (halved baked potatoes with some of the inside scooped out) topped with some shredded cheddar - so good! Heat oil in a large stock pot. Add diced onions and minced garlic and saute for 2-3 minutes, or until onions are soft and translucent. Add turkey, taco seasoning and salt and brown turkey over medium heat for 6-7 minutes, (or until turkey is cooked through). Stir frequently to crumble turkey.